The conference has presented the results of the project III 46006 "Sustainable agriculture and rural development with the aim of realizing the strategic goals of the Republic of Serbia within the Danube region", project period 2011-2015, which is funded by the Ministry of Education, Science and Technical Development of the Republic of Serbia. 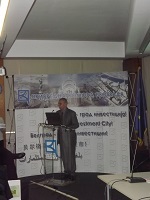 The conference was organized by the Institute of Agricultural Economics Belgrade in cooperation with 35 eminent institutions from Serbia, Montenegro, Bosnia and Herzegovina, Romania, Bulgaria, Austria, Poland, Russia, Germany, Norway, Moldova and the Netherlands under the auspices of the Ministry of Education. Science and Technical Development of the Republic of Serbia. In the presence of a large number of guests from across the country and abroad, the scientific conference was opened by Prof. Zoran Ma§i6, State Secretary of Ministry of Education. Science and Technical Development of the Republic of Serbia. After that, the audience was spoken to by Prof. Zoran Rajie, State Secretary of Ministry of Agriculture and Environmental Protection of the Republic of Serbia; MA Svetozar Krstie, Executive Director of the Belgrade Chamber of Commerce and Prof. 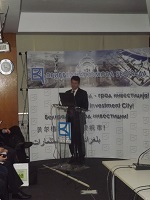 Dank) Tornio, president of the Steering committee of the Institute of Agricultural Economics Belgrade. With words of welcome, the audience was addressed by our guests from abroad: Prof. Gabriel Popescu, Director of the Department for Agri-food Economics and Environment at the Academy of Economic Studies, Bucharest, Romania; Dr Adam Wasilewski, Institute of Agricultural Economics and Food- National Research Institute, Warsaw, Poland; Dr Andrei Vasile, Petroleum and Gas University of Ploiesti, Romania and Dr Bogdan Bazga, on behalf of the European Commission for Agriculture. Within the plenary sessions, Dr Adam Wasilewski, Institute of Agricultural Economics and Food- National Research Institute, Warsaw, Poland presented his works. The following participants also presented their plenary papers: Dr Andrei Vasile, Petroleum and Gas University of Ploiesti, Romania, as well as Raluca Andreaa Ion, Department of Agri-Food and Environmental Economics, Academy of Economic Studies, Bucharest, Romania. Following the Conference, 38 works have been presented in four sections, signed by 73 authors and co-authors. The works unified new knowledge in the field of new technologies and sustainable use of natural resources in agriculture; then, knowledge on producing and marketing agricultural products with special quality characteristics. The results of research on the topic of strengthening institutions and regional cooperation have been consolidated, as well as the current knowledge in the field of sustainable tourism. On the second day of the scientific conference a round table titled "The possibilities of applying new clean technologies in agriculture" was organized. which attracted much attention of those present and initiated an interesting discussion. During the Round table the results of collaboration with the Centre of Robotics, Institute "Mihajlo Pupin" were presented, as well as the results of our associates achieved so far. It was agreed that the conclusions of the round table together with the conclusions of the conference get used for future collaboration. The International scientific conference aroused huge interest, which justifies the visit and active participation of a large number of scientists, experts and guests from home and abroad. Papers that were published after positive reviews emphasize the significance of topics and the fact that they are current, both in Serbia and other Balkan countries, as well as in Europe and the world.